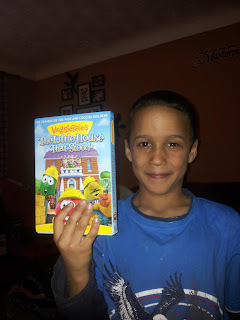 Mom's Musings: Veggietales - The Little House That Stood Review and Giveaway! Veggietales - The Little House That Stood Review and Giveaway! I was contacted to receive and review the Veggietales movie "The Little House That Stood", (see The Little House That Stood trailer on YouTube) and I jumped on it as fast as I could! This year marks the 20th year of Veggietales and I think we have seen (and our family owns) every episode! We live in an area where a local bookstore rents out a local theater and they sell tickets to see the new episodes as they come out, and our family goes every time. It is a great morning out and the theater is filled to capacity everytime!! Last weekend we got to preview The Little House That Stood at the theater and it lived up to every other episode we have seen. I love that they make the stories applicable to the kids and even throw in some fun for us adults. It is also nice, when in the theater, to notice that my family isn't the only ones who love the theme song and laugh uncontrollable when Larry the Cucumber (he's NOT a pickle;-) falls over at the end. The whole theater erupted in laughter, including myself. I really enjoyed how they made this story a fairytale type, using the 3 Little Pigs, a story that we all know and love. The kids were able to follow along, and get the lesson out of it at the end. ﻿Open to Canada and the US only. Ends on March 20th, at 11:59pm EST. What is your favourite Veggietales Movie? 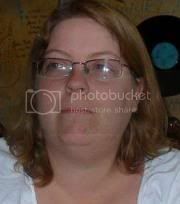 "Disclosure of Material Connection: I received one or more of the products or services mentioned above for free in hope that I would mention it on my blog. Regardless, I only recommend products or services I use personally and believe will be good for my readers. I am disclosing this in accordance with the Federal Trade Commission's 16 CFR, Part 255: "Guides Concerning the Use of Endorsements and Testimonials in Advertising." All opinions expressed in this post are my own...we do REALLY LOVE VEGGIETALES!! I like Princess and the Popstar. Unfortunately we haven't seen any of these movie in our family so we don't have a favorite yet. I hope that we win this one - The Little House that Stood would be our favorite!